The Bike More Challenge is a fun, free competition to encourage your friends, family, and colleagues to experience first hand joys and benefits of riding a bike. There are lots of fantastic prizes to tempt your team, which we'll announce as the Challenge approaches. Businesses compete against each other to see who can get the most staff to ride a bike and log their trips between May 1-31. We use a simple points model to allow workplaces to compete with each other across their size category (see the points system below). 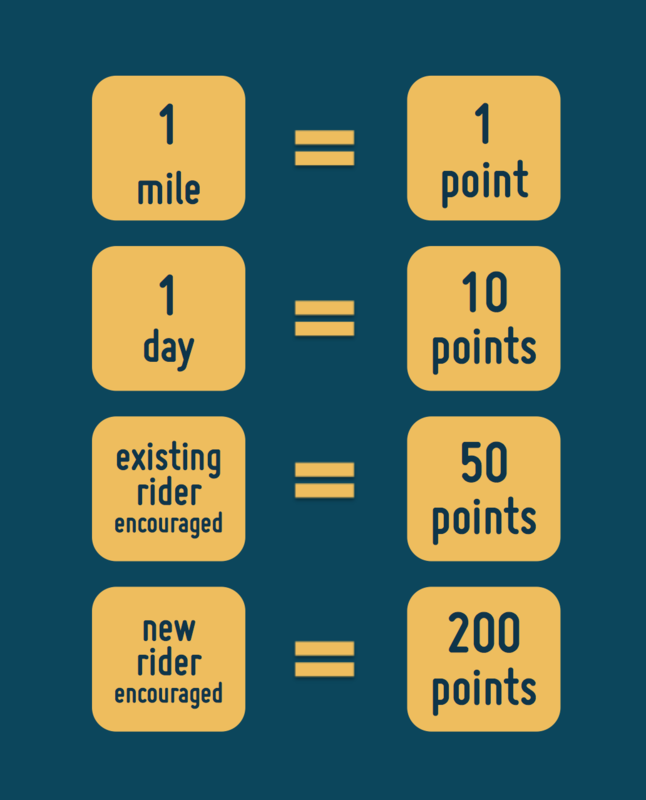 The points system has been carefully selected to ensure a fair and exciting competition, and to strongly encourage workplaces to engage new riders if they want to climb the leaderboard and secure victory! For example, if you are new to bicycling and your friend Jane encourages you to bike you will earn 20 points each day you ride PLUS 1 point for each mile you ride. And Jane will earn 200 points for being the one to encourage you to ride! Prize incentives including bike gear and more! Organizations and departments will compete against those of a similar size for a fair chance of winning. There are six size categories: 500+ staff, 200-499 staff, 50-199 staff, 20-49 staff, 7-19 staff, and 3-6 staff. Your participation will count towards your department's and your organization's score - the more staff that participate in the challenge, the more points your team earns! You can always borrow a bike from a friend or rent one from a local bike shop. BIKETOWN is also an option. Use the Ride Report app to record your rides. The app works in the background to automatically detect when you're riding your bike (from the accelerometre data, GPS and other phone sensors). So you don't need to remember to open the app or press start or stop when you ride. It does it all automatically for you and then syncs your rides to the Challenge website!